So, here you go drivers, another one, as I promised for the new year, your 2nd in a line of brand new CB chatter files this year just over a hour long. I only post these to 3 SCS mod sites so if you see em elsewhere thanks to whoever is sharing em, but this site is one of the ONLY 3 sites I use. 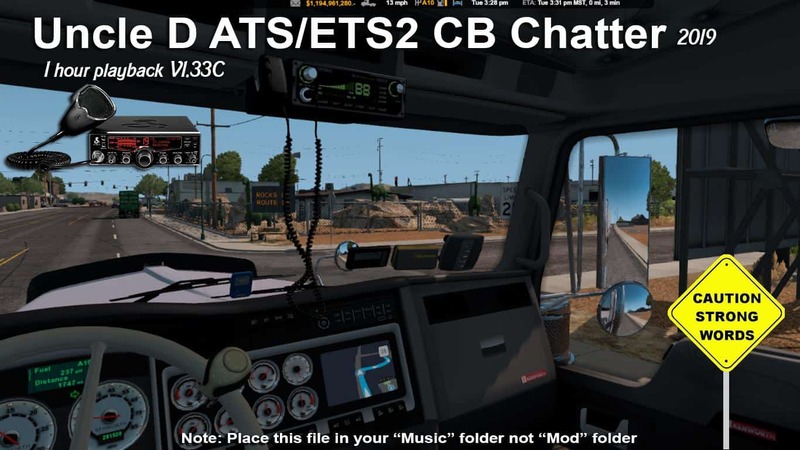 You’ll never see these chatter mods in the Steam ATS workshop as the workshop only uploads mods to your “mod” folder and my CB chatter mods will always go in your “music” folder NOT “mod” folder. As always with my CB chatter mods, WARNING DRIVERS FOR THE ADULT LANGUAGE!!! 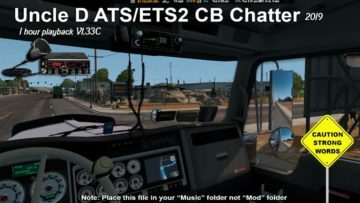 these files are not intended for younger SCS drivers or sensitive listeners, and if you know how REAL truckers talk on their cb’s then you already know most have the dreaded “potty mouths”. (and no I will not censor these playbacks) This mod is simply a studio edited MP3 file and you will place in your SCS “MUSIC” folder not “MOD” folder and play with your in cab radio playlist ok. Other than that enjoy em drivers, got plenty new ones coming this year and keep on trucking and keep on talking @#$@ on dem radios out there drivers!